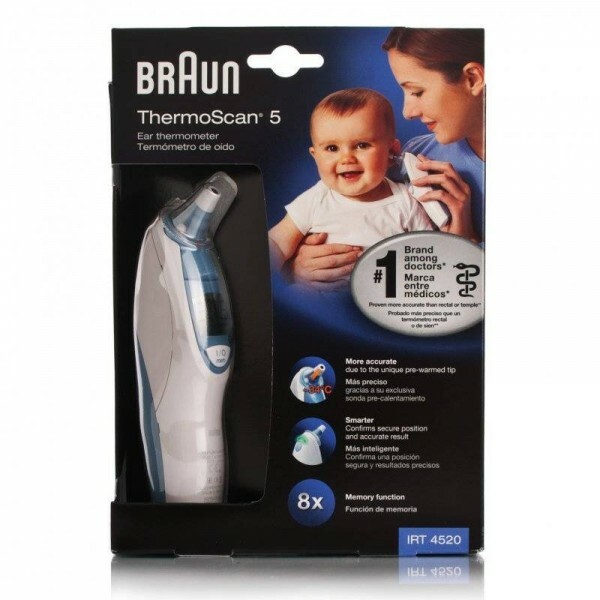 Braun Thermoscan Exactemp 4520 Ear Thermometer provides core body temperature in seconds in C and F. 21 refills for hygienic and accurate readings. Ideal for newborns and the whole family. Ultra soft and gentle tip is warmed up for total comfort and accuracy. 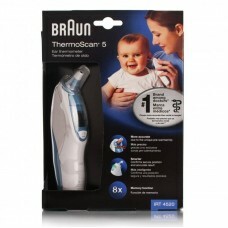 Braun Thermoscan Exactemp 4520 Ear Thermometer features: Used by more GPs and mothers worldwide Reflects core body temperature in seconds in °C and °F Feedback system confirms the accuracy of readings for ultra peace of mind Ultra soft and gentle tip is warmed up for total comfort and accuracy 21 refills for hygienic and accurate readings. Ideal for newborns and the whole family. Ultra soft and gentle tip is warmed up for total comfort and accuracy. Feedback system confirms the accuracy of readings for ultra peace of mind. Has been carefully developed for accurate, safe and fast temperature measurements in the ear. The shape of the thermometer prevents it from being inserted too far into the ear canal to damage the eardrum. However, as with any thermometer, proper technique is critical to obtaining accurate temperatures. Therefore, read the use instructions, you receive with your own product, carefully and thoroughly.